Heat 1 tablespoon oil in a large cast iron skillet to medium-high heat. Add ¾ of the onion and saute 4-5 minutes, until soft. Add garlic, oregano leaves, coriander, cumin and ½ teaspoon salt and pepper and saute 30 seconds. Add ground meat and cook until browned, about 5-6 minutes, using a spatula to break it into pieces. Taste and adjust seasonings, if necessary. Remove meat mixture from the skillet and place in a bowl; set aside. In the same skillet, heat remaining tablespoon of oil to medium heat. Add remaining ¼ of the onion and the cubed potatoes. Season with ½ teaspoon salt and pepper. Cook for 10-12 minutes, stirring frequently and adding oil if pan is too dry, until potatoes are crispy on the outside and fork tender. Taste and adjust seasoning, if necessary. Sprinkle with a few red pepper flakes, if desired. During the last 2-3 minutes of cooking the potatoes, add meat mixture and cherry tomatoes back to the pan. Top with olives and feta cheese. While potatoes cook, heat a medium-large nonstick skillet to medium heat. Coat pan with cooking spray. Crack 4 eggs into the pan and sprinkle with salt and pepper. Turn pan to low and cook, without flipping, for 2-3 minutes, until egg white is cooked, but yolk has not set. For the last minute of cooking eggs, place a fitted lid over the pan. 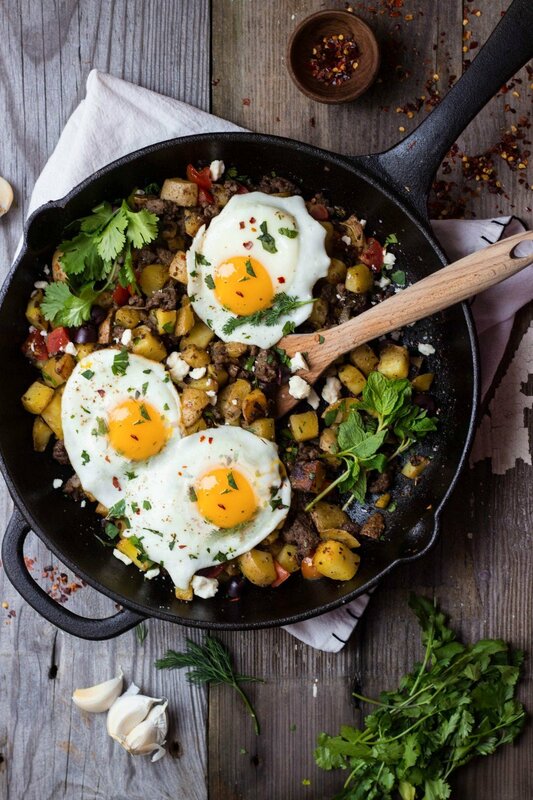 Place eggs on top of skillet and garnish with chopped cilantro, mint and/or dill. Serve with toast and/or pita and drizzle with mint pesto and/or tzatziki sauce, as desired.